Back in 2010, well before the ‘I Quit Sugar’ craze took hold, we cut the sweet stuff out of our diet. It was part of a larger change in how we eat and in one fell swoop we cleaned out the cupboards and went cold turkey. (If you’re interested, you can read all about it here). The first few weeks were challenging to say the least but the results were remarkable. I’ve learned a bit over the past few years, now use rice syrup instead of apple juice concentrate amongst other things, and while I’m not quite as good as I used to be back then I do still follow the basic principals. I’m currently working on getting back into the groove. Around the same time we settled into our new patterns I started to follow Sarah Wilson’s posts about sugar – or the absence of sugar as the case may be – and watch with interest as her personal experiment turned into a worldwide phenomenon. First came the I Quit Sugar Program, then the IQS Cookbook, and soon she’s launching an online portal. 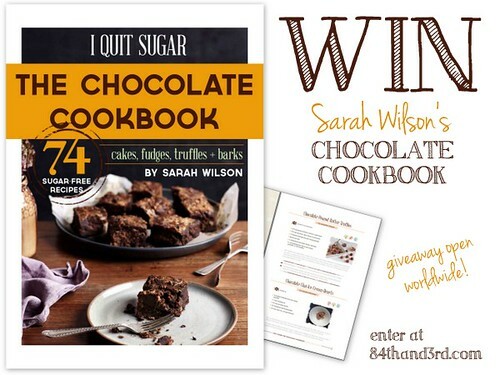 So when an opportunity to contribute a recipe to Sarah’s new IQS Chocolate Cookbook came up I jumped at the chance. What do you know but one of my submissions was selected. 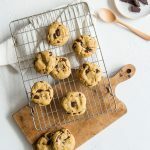 In addition to 74 delectable chocolate recipes that are nearly healthy enough to eat for breakfast there’s a load of information about cacao vs cocoa, super-food ingredients found in the recipes, and sweeteners that don’t contain fructose. As a contributor I have a copy to give away and I figured there would be a few people out there who would like to get their taste-buds on this one! Giveaway open until 11.59pm Saturday 10 May (Sydney time). Winner will be selected based on the best comment about what naughty treat you wish was healthy. Winner will be notified via the email address linked to their entry. Open to persons with Australian mailing addresses only. I’m inspired by everyone’s answers about what foods they would like to flip, you can bet you’ll see many of them show up here at some stage! Of course there are a heap of naughty-but-nice chocolate recipes already floating around in my archives including Vegan Chocolate Ice Cream, Choc Macadamia Spread, Vegan Chocolate Fudge, Banana Split Spread, Vegan Vanilla & Choc Cheesecake and Choc Hazelnut Spread, and you can always find all my refined-sugar-free dessert recipes here. 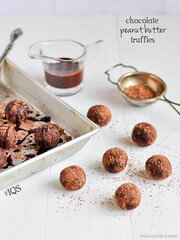 But in the meantime it’s only fitting I share the recipe that made it into the book – Chocolate Peanut Butter Truffles! Oh, you may want to wipe your chin, there’s a bit of chocolate on it. 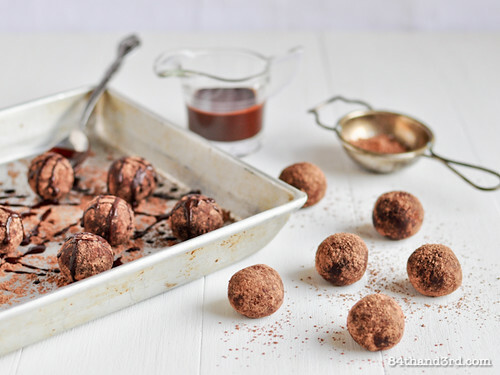 These no-sugar truffles are the perfect treat to cure any craving. They have been adapted from one of my original recipes for inclusion in I Quit Sugar: The Chocolate Cookbook. Grab yourself a copy and check out all 74 luscious chocolate recipes! Stir together all ingredients, except extra cacao, until well combined. If necessary add more oat bran a teaspoon or so at a time until the mixture is firm. Scoop or pinch off small pieces and roll between your hands to create truffles. Drop onto extra cacao powder and shake gently to coat. Eat immediately or refrigerate for 30 mins and roll in a second coating of cacao. 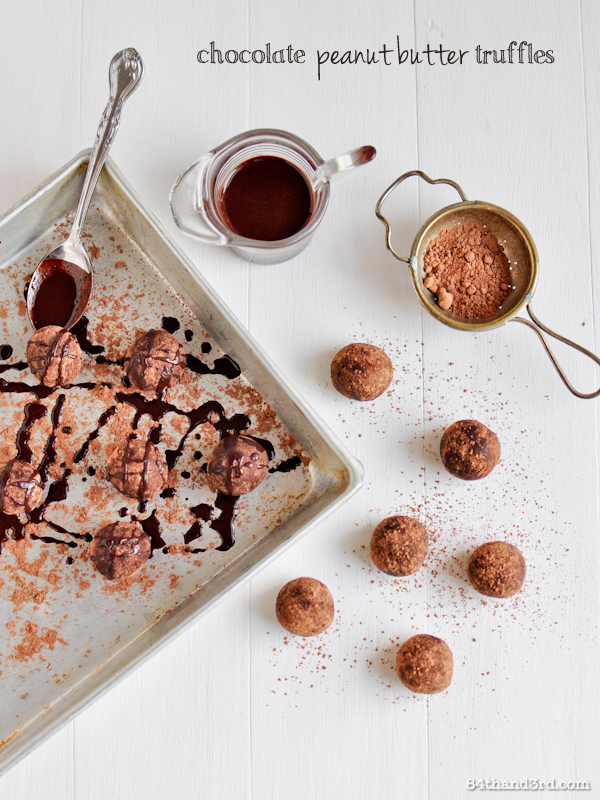 For an extra decadent treat mix equal parts melted coconut butter and coconut oil with a bit of cacao powder and drizzle over cold truffles. Substitute the peanut butter with any other nut or seed butter, simply adjust the quantity of oat bran as needed for the consistency of the butter. Macadamia butter, almond butter and even perhaps tahini would be perfect. This post is not sponsored, however a copy was provided to me as a contributor to the IQS Chocolate Cookbook. I will receive a small commission if you purchase the book after clicking on the links in this post. I’m on a big homemade marshmallow kick, but have been trying to hold back as they are packed with sugar! Oh that is a tricky one, now you have my mind ticking over! We recently cut all refined sugars our of our diet and the results have been amazing! 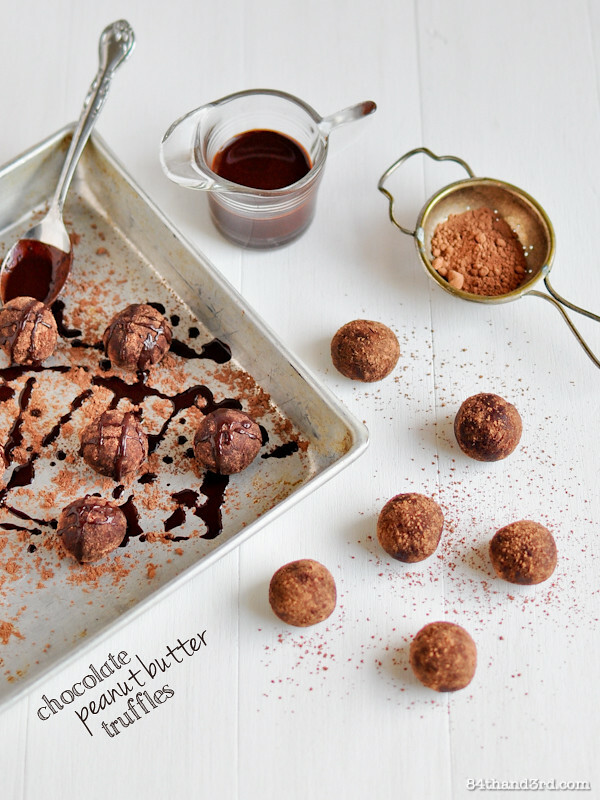 These little PB truffles look great! When you say “amazing” and “remarkable” what do you mean exactly? I know how awful sugar is for our health (in many respects, a poison) ….and I love desserts; really addicted to sweet treats. I would love to wean myself and learn to love veggies more. Thanks! Your truffles look fabulous, I love the peanut butter! JJ these look amazing! I want to pop one straight in my mouth! I would love to win a copy of the book. Oh nice one! I have to say Vegan Chocolate Ice Cream is pretty good in a pinch but Gelato Messina is the best. There are a couple brownie recipes in the book, good luck! Yum! I’ve had my eye on these since you posted this and made them this morning – delicious. As for what I wish was healthy..hmmm just sugar!! Excellent, glad you enjoyed them! I fundamentally don’t believe in calling foods naughty, but I want to enter so goodbye morals! 😉 So I’ll say I wish the food pyramid told me to eat entire jars of peanut butter. How about gluten free, sugar free, dark chocolate orange truffles? Now that can definitely be done! Hmm, if there is one thing that I wish was healthy that I have not yet found a good sub for, it is: my mother’s pasta dishes and cakes. They just dont taste the same slimmed down. Wow, thanks Laura! I’d love to give one of your favourites a recipe-flip, feel free to email me! Tough question…I’m so used to healthy treats now that I don’t think there are many unhealthy foods I miss. Maybe almond croissants! They’re pretty tough to healthify! Looking forward to making the choc pb yummies. I just found your website today and it is awesome! I just convinced my husband that our family should give up sugar, but he has such a sweet tooth. I know being able to have something sweet on occasion will be nice. Omg, i’m already in love with these truffles! They look gorgeous! I wish my moms noodle kugel were healthy! 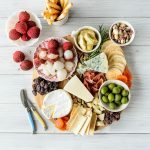 Wow, these look incredible… I was just thinking today about how lucky we are to be living in a world with so much more knowledge and awareness about nutrition (still not enough in my opinion, but SO much more than a just few decades ago). I was just looking at a Pinterest recipe for Snickerdoodles. Those would be wonderful, if they weren’t so “naughty”. Thanks for the chance to win! Amazing! These remind me of my protein balls that I make. Sometimes I wish macarons were healthy, because I always find myself sneaking one in everytime I make a batch! i don’t believe there’s naughty (and nice food). that just fuels fear about food. there’s too much of that! food is food. No-bake cookies with peanut butter. I love the dense, chewy texture. We have been on a no-sugar fast for 2 weeks now and I think the only reason I have stuck to it this long is that my family is always around to witness what I eat. Can’t wait to try these. Thanks. I wish oh wish that apple crumble was healthy but still buttery, gooey and moist! Also I’m just loving your blog at the moment, how have I not been addicted to this before. You girl are inspirational! I am obsessed with Nutella, it tastes beautiful on everything! I wish it was fat free. I wish German chocolate cake was healthy. I don’t like to think of any treats as truly naughty, but I do wish caramel was better for me! This cookbook sounds fab – I didn’t know that brown rice syrup was better for you than apple juice, for instance! They can definitely be refined sugar free! I know they’re american and I’m not, but I am obsessed with Reece’s Peanut Butter Cups.. I also wish cheeses like triple cream brie were good for you and vegan.. soy cheese just isn’t the same unfortunately! Reece’s Cups don’t descriminate ;D I have to say these truffles cure that choc peanut butter fix pretty well! there is so much decadent sugar goodies i wish were sugar free….. say choc cake with a hepa of icing! OK – I cannot get over how good these look. If this is what quitting sugar looks like then sign me up! Hard to believe these delectable chocolate goodies are sugar free! I definitely eat waaay too much sugar and should really start making more sugar free desserts. I definitely need a copy of this book in my life! I need this book! I love to bake, total foodie and family member has recently been diagnosed with type II diabetes. Looking for alternatives to sugar filled desserts that still provide that sweet treat! 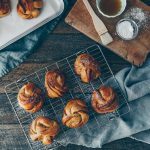 Looking for ways to cut back on sugar and these look so tasty! If I had to pick a treat I wish was sugar free it would be ice cream especially as it gets closer to summer! Pure fruit frozen and blended is a great summer treat and so easy to make, try bananas and mango to start! My pick for naughty treat that I wish was healthy is the donut. I wish that Sticky Date Pudding with butterscotch sauce and creamy vanilla ice-cream was healthy! I wish cheesecake was a little more healthy. The truffles look great and I’d like to quit sugar or at least cut back. Anything with flakey pastry, especially croissants! such a challenge on that one! How I wish chocolate cheese cake was healthier. I love it! hi there! i am so glad i came across your website. 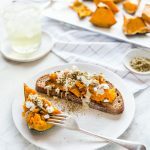 this recipe looks amazing and i cant wait to try it! however i was wondering if i could use oatmeal/rolled oats instead of oat bran? will that be okay? could i use table salt instead of sea salt? Hi, glad you like the recipe! You could use oats… I’d blitz them in a processor/blender first to make them finer – otherwise the truffles will just me more, rustic ;D Table salt is fine I’d use a bit less though. Enjoy! I came across your website because I searched for sugar free cacao recipes. I used to be addicted to sugar and I considered myself to be a sweet tooth. This may have started in childhood because I had several molars removed when I was 4 to 5 years old from eating too much sugar and I began eating sugar more when I had children because I was so tired and I used it for energy and a way of rewarding myself. I tried chromium and that lasted temporarily. But to cut a long story short I am no longer a sugar addict and I don’t crave sugar, in fact I prefer savoury and when I eat something with lots of refined sugar it doesn’t appeal to me anymore; it tastes fake and sickly sweet. I went on a diet and began eating healthy and that’s what curbed my sugar cravings. I now prefer healthy recipes with cacao powder and healthy sugars such as rice syrup, coconut sugar etc. A lot of the recipes that I make for sweet foods are raw based and my children are getting used to it too. I even made Sarah Wilson’s ‘Nutella’ recipe and it tastes much better than the real thing. I’ve cut out sugar by 90% per cent on a daily basis and I feel fantastic!